Came via the Book Bench to a piece on Publishers Weekly by a book addict, a man who habitually goes to bookstores with no particular book in mind and walks out with three or four. He thinks he has too many books. He comments that most of the books are unread. (He has read 85 of 371.) He likes to think being surrounded by so many unread books is an expression of aspiration, on the whole a good thing. Commenters then offer advice. The advice given in at least a couple of cases is be ruthless and get rid of UNread books. Got an e-mail from a friend who had listened to the podcast with my sister. He said she laughed and said it was 'just like Helen'. This is strangely terrifying. Piece in the Guardian on Zero Books, with interviews of many of its authors . . .
SS: What was the background to your involvement in Zer0? MARK FISHER: When Zer0 started, I was very conscious that the culture which formed me – free higher education; innovative public service broadcasting; a music press that unashamedly engaged with theory – was disappearing. In place of this egalitarian space, where concepts and theories could be encountered in popular contexts, there was a rigid split between, on the one hand, specialist academic writing that didn't engage anyone and wasn't really supposed to, and, on the other, facile populism. Zer0 wanted to disrupt this; it wagered on people's intelligence and appetite for writing that was lucid but conceptually dense. The Zer0 project promised to make available the kind of writing that I wanted to read myself but which you couldn't read anywhere except online. I belong to a lost generation, really, one forced into online exile online by the lack of space in print culture for the kind of writing I was doing – writing that's too journalistic to be academic, and too theoretical to count as journalism. I'd got so habituated to this exile that, before the first books were published, it was hard to believe that the books would ever actually come out, still less be successful. SS: Does a physical book perform certain kinds of function more effectively or differently from blogs or ebooks? NINA POWER: The thing that really surprised me was the very different status a book still has in people's minds, even if the arguments and the texts have already appeared online in blogs and journals (which is where most of One-Dimensional Woman came from). The book still retains a curiously weighty status in comparison to blogs. A book is a snapshot of whatever it was you felt was interesting at that moment, and it's fixed in aspic, which can have its drawbacks. SS: How do you see the relationship between pop music and "criticality" these days? OWEN HATHERLEY: The writing many of us encountered in the music press in (roughly) the 80s-mid 90s was exemplary in its combination of mass audience, unpatronising erudition, politicisation and fearless, sometimes experimental prose, and it is in lots of ways a model for what we tried to do with Zer0. That world rather disappeared in the late 1990s and then reappeared on the internet, with blogs by Simon Reynolds, Mark Sinker, Ian Penman, Taylor Parkes. The writing has become more distant from contemporary music, for reasons that are debatable – certainly music doesn't seem to articulate conjunctural events as it used to; to use a banal example, a Ghost Town for last year's riots is now inconceivable, so broken is that link between the streets, the music press and the charts. So we're trying to produce the same sort of writing but on completely different subjects. InDefinite Podcast has published a podcast of me reading from Lightning Rods. I am not necessarily endorsing or advocating, but it's here. 1. If you teach, and select texts for your courses on the basis of which poets (not poetry) you like personally, or owe a favor to, or are part of an organization with, or want to impress, and not on the basis of a text’s pedagogical utility -- its value to those you were hired to teach and whose intellectual welfare is partly your responsibility -- you may be a tiny bit corrupted. 2. If you slander or libel poets you don’t know based not on information you actually have but your own personal guesses about what type of person they might be, and / or a disagreement they had with a friend of yours many years ago, and can’t find it in yourself to forgive and / or forget but instead only to pass your bitterness on to others down through the years, you may be a tiny bit corrupted. 3. If you can’t take joy in the successes of friends and / or those who are not friends but whose work you recognize as having substantial artistic merit, you may be a tiny bit corrupted. 4. If you choose when and where to write a poetry review on the basis of personal allegiances and not genuine admiration for the work you’re reviewing, you may be a tiny bit corrupted. 5. If you choose which poets to read based on anything other than your admiration for their work -- their clothes, their haircut, their power and influence, their friends, the extent to which you see them or their lives as a mirror of your own, their physical proximity to you or to someone/ something you want -- you may be a tiny bit corrupted. 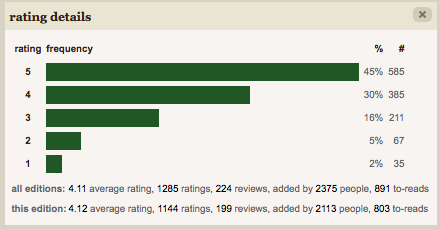 Lightning Rods was rejected by 17 editors when Bill Clegg sent it out; it was rejected by another 4 or 5 years earlier; this looks like a unanimous rating of <= 2 stars. I contemplate the fact, though, that many of the people who HATED the book are of my mother's generation - and my mother HATES COMPUTERS. She tried e-mail, grudgingly, for years; six years into the trial she had not gone online once to check out a website. So she would certainly not sign up for GoodReads; if the sort of person likely to hate the book is also the sort of person unlikely to sign up for GoodReads, this would naturally affect the distribution. How much easier life would have been, I can't help thinking, anyway, if the distribution among editors had matched that of readers on GoodReads. Or rather -- it's so complicated with editors. Bill said 16 out of 17 editors thought the book was funny and well written but they could not see publishing it, which maybe means they anticipated most readers giving it a rating <= 2 stars. 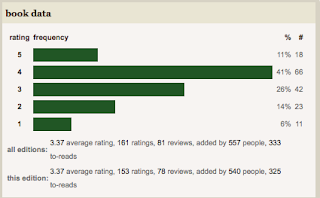 Would an anticipated distribution like that of GoodReads have tipped the balance? (How much easier life would have been had the distribution of editors anticipating a distribution like that on GoodReads matched the distribution on GoodReads . . .) But regrets are fruitless. On with the show. The Maginot Line (French: Ligne Maginot, IPA: [liɲ maʒino]), named after the French Minister of War André Maginot, was a line of concrete fortifications, tank obstacles, artillery casemates, machine gun posts, and other defences, which France constructed along its borders with Germany and Italy, in light of its experience in World War I, and in the run-up to World War II. Generally the term describes only the defences facing Germany, while the term Alpine Line is used for the Franco-Italian defences. The French established the fortification to provide time for their army to mobilise in the event of attack, allowing French forces to move into Belgium for a decisive confrontation with German forces. The success of static, defensive combat in World War I was a key influence on French thinking. Military experts extolled the Maginot Line as a work of genius, believing it would prevent any further invasions from the east (notably, from Germany). It was also a product of a historical inferiority in population and birthrate, exacerbated by the losses in World War One, which had been developing for three generations. The fortification system successfully dissuaded a direct attack. It was strategically ineffective, as the Germans indeed invaded Belgium, defeated the French army, flanked the Maginot Line, through the Ardennes forest and via the Low countries, completely sweeping by the line and conquering France in days. As such, reference to the Maginot Line is used to recall a strategy or object that people hope will prove effective but instead fails miserably. It is also the best known symbol of the adage that "generals always fight the last war, especially if they have won it". A commenter on my last post suggested running Ruby on Rails on Heroku. I had a look at Heroku and was transfixed - this looked like a way to try out all sorts of programs without getting mired down in all the downloads and installations and what-have-you that mean it can easily take a week to get through the preliminaries before you can actually try out whatever it is you thought you might like to learn. Preliminaries that would undoubtedly take half an hour if you were already up to speed in all sorts of techniques you hadn't realized you needed to know, but which take a week (or more) if you have to scour around online to find out how to implement the two lines of instruction that accompany whatever it is you actually want to be working on. So, right, I have a look at Heroku, which looks great, and I think I might try this out on Python since I have been working on Python. I am then told that over and above having Python to hand I must also have pip and virtualenv. Bear in mind that the attraction of Heroku comes largely, at this point, from the fact that I have just spent a day untarring tarballs, attempting to upload from my Mac's simple FTP facility, attempting the same from Cyberduck, succeeding at last via FileZilla, creating a database on my server, attempting and failing to find the relevant files in the unpacked Drupal folder via myPHPAdmin, scouring around online for alternatives, attempting and failing to follow the steps sketched out on various websites, investigating the possibility of changing servers, and at last discovering the various bits of information from my server that needed to be fed to Drupal for successful installation. Bloodied and not noticeably unbowed, I wonder whether life might be easier if I defected to Heroku. Only to find myself blundering through attempts to download and install pip and virtualenv, scouring around online for tips when all goes less smoothly than one might have hoped . . .
Revenons à nos moutons. To get back to the Maginot Line. If you're a writer, you need protection. You can hire a lawyer, an accountant, an agent. But the protection you hire never costs your time; it never sets a value on what you might achieve if you could invariably get the technical resources you needed in 2 seconds. The protection you hire will wrangle happily over deal points; it will wrangle over percentages of rights. It will NOT factor technical support into the value of a deal (this is not a deal point), it will NOT provide in-house technical support as facilitating completion of ambitious new work which might be sold for a handsome advance. It ignores both the greatest threats to a writer and the greatest opportunities. And there is nothing to be done. Except, of course, to soldier on. Install, presently, pip and virtualenv. Tomorrow is another day. Elena, the Russian poet I stayed with in Paris, came to Berlin for a couple of days. She stayed one night in the room with the sofa futon and piano, claiming bravely that she liked rooms that were fraîche (the coal heating does not make room temperature significantly warmer than the frigid outside world). Yesterday we had lunch with her friend, Mark, who talked to me about programming. 'What do YOU think I should learn?' I asked. Mark said he would recommend Java, PHP and Drupal, especially Drupal. I had a look at the Drupal website today. My heart sank. Anything that involves setting up a database on my webserver, 1&1, is a threat to sanity. (I would have changed servers years ago, except that transferring a domain from 1&1 is another fast track to the psych ward.) This is, needless to say, one reason occasional thoughts of trying out Ruby on Rails have been strangled at birth. But no, no, no, we must face our fears. In this case, the fear of a server that has a proliferation of user IDs and host names and multiplies entities upon creation of a database. With the result that, needless to say, the attempt to install Drupal led to many, many error messages, hours of scouring around online, an hour when changing servers (even if it meant the madness-inducing domain transfer) looked like the only way forward . . . and in the end, of course, the answer was very simple. The name of the database requested by Drupal was NOT the name the creator of the database had innocently assigned it, it was the string of letters and numbers assigned by 1&1; the user name was a similar string of letters and numbers; and the local host (yet another string of letters and numbers) was crucial. When all these were supplied, Drupal installed in 2 seconds. So, oh dear. I now come upon a pronouncement by Jonathan Franzen on the subject of books in print and the value, to those who care about literature, of permanence. And I contemplate the fact that Mr Franzen is, to the best of my knowledge, a very nice man. One day I might run into this nice man at a party in New York. I don't want to hang my head in shame and admit, at last, that I am the terrible person who said all those terrible things on a blog. But-- someone is WRONG on the Internet!!!!!!! Franzen is 52. I am 54. Two years would not normally suffice to place the older of the two in the class of REALLY OLD fogeys, as opposed to the class of the merely old--but I am a classicist. No classicist can take this view of the sanctity of print; one mark of the serious scholar is, of course, a preference for the printed text that comes with an apparatus criticus, that is, one which publishes important variants from the manuscript at the foot of the page. Which is to say, of course, that we are trained to be aware of the errors that creep in during transmission; we are trained to regard corrupt texts with horror. And when we are confronted with the process through which a modern text comes to print, we see it as a battle: a battle in which those publishing the book do their best to smuggle corruptions into print, against more or less effective opposition from the person who had the misfortune to write it. It is an unhappy fact that the relation between what the author wrote and the published text depends, to a very great degree, on the power of the author and his/her representation. When one reads books that have made it into print, the author may well have thought long and hard about what the text should be; the extent to which this is reflected in the text varies according to the strength of the author's position. This somewhat brutal class system is ubiquitous in the realm of printed texts, and is, of course, virtually unknown online. In the blogosphere, the authors of webcomics put up whatever they choose; Steve Dodson of LanguageHat writes what he likes; Tyler Cowen of Marginal Revolution writes what he likes; Cosma Shalizi of Three-Toed Sloth, Andrew Gelman of Statistical Modeling ...., Jenny Davidson of Light Reading, Tired Dad of Tired Dad, all are on an absolutely equal footing when it comes to presenting to the public what they happen to want to say. I have a Kindle; I would like to have an iPad; I also very much like printed books. I am working on various programming languages; despite the wealth of material online, I also have a table piled high with reference books, which I find enormously helpful. I have about 3000 books in my apartment, come to think of it; I could get a cheaper apartment, no doubt, if they were all on my Kindle, but I like having them available for reference in this form. But there are trade-offs which I can't ignore. If I read Syme's Roman Revolution, I am struck by the idiosyncratic English, English like nothing any other writer in the language would think to perpetrate, English influenced by the Latin of Sallust and Tacitus-- English which the typical anglophone editor would fight long and hard to 'correct'. In our fallen times we have access to a range of usage closer to the range one finds in Greek, in Latin, when we go online; the publishers of our printed texts do their very best to give us Wonderbread, Kraft's Processed Cheese, Skippy's Smooth Peanut Butter, Welch's Grape Jelly. A Thucydides, a Tacitus might certainly get into print -- wealth permitting. I wish it were not so; I merely state publicly what has been said to me in private many times by editors and agents over the years. But I hope I have not said this in a way that will leave me embarrassed and tongue-tied if I meet Mr Franzen one of these days at a party. Another basic difference between the compositional technique of Liszt and Chopin was observed long ago by Donald Francis Tovey, and Feux Follets once again offers a good example. When the principal theme in B-flat Major returns in the new tonality of A Major, it has become very awkward for the hands to play the double-note trill and chromatic scale as the relation of black to white keys has changed with the new key,2 and Liszt accordingly rewrites the theme in a new form that fits hands to the new harmony. Chopin, as Tovey remarked, is more ruthless: when a figure that lies well for the hands in the opening key returns in a less convenient form, he generally demands that the pianist cope with the new difficulty, refusing to make any musical concession to the physical discomfort. Liszt is often supremely difficult but almost never really awkward, and always composes with the physical character of the performance in mind. In the conception of modern virtuosity, he was even more important than Chopin, whose achievement was more idiosyncratically personal. Splendid piece by Charles Rosen on Liszt in NYRB. Was watching a YouTube video on time series in ggplot2, moved on to another YouTube video on ggplot which turned out to be in Brazilian Portuguese. In which, it turns out -- I could probably have worked this out if I had thought about it - g is pronounced like the j of French je, and the final t is pronounced (roughly) tchi (because no word can end in a consonant in Br. Portuguese) - in other words, jéjéplotchi. Impossible not to love. When the dog barks, when the bee stings, when I'm feeling sad, I shall think of jéjéplotchi and not feel so bad.